Each of the shoots for this project could often be a project in themselves. The way we have been working for Washing Lines poses a dilemma as only one image can represent each of the individuals and groups in the final selection. We have to apply all we know to translate a person’s story into a single photograph. But this conceals the journey and process behind creating each image and more often than not it hides the fun we have too. In the final run up to the exhibition, having taken our last Washing Lines portrait this morning, I wanted to share some of the candid images that I always try to grab when we are hanging a line. There is a lot of mischief and banter behind the camera to create the final work that I find pretty contagious. Last night we were really thrilled to be featured on STV’s late Bulletin alongside Glasgow Open House co-director Phoebe Barnicoat. STV journalist Allison McCallum joined us on a shoot with allotment users in Dennistoun in the glorious sunshine last weekend. She interviewed Paula as well as some of the residents to hear their thoughts about community, washing and Dennistoun. She created a really beautiful piece which includes several images from the project. I was invited to the studio to talk to Lucy Whyte about the logistical and creative aspects of the project. With only one week to go before the exhibition, I feel I could talk for an hour, but the final images will do all the talking for me. You can watch the full Bulletin here, though apologies to visitors from the future as the link may have a limited life span. It is only two weeks until the exhibition launch with Glasgow Open House Art Festival, and we’ve been doing more than just hanging out. Tonight we met local ice cream parlor trio Harry’s Ice Cream and their amazing bunny costume. We are meeting a single mum first thing in the morning and then off to Reidvale Housing Association Allotments with STV Glasgow to shoot the local gardeners. The piece de resistance will be meeting the owner of Connie’s Bathrooms tomorrow afternoon. If you know Dennistoun you will know Connie’s amazing van collection with bathtubs, mannequins and rubber ducks dotted throughout the neighborhood. It has been amazing to have had such a warm reception to the project. We are really coming into our stride and meeting so many wonderful people in the closing weeks of the projects first phase. We really are getting to know Dennistoun, and it keeps becoming even more colourful. Pretty much this, my local launderette, the source of inspiration that sparked the entire project. I must have walked past it a hundred times, but I’d never been in. Partly because I’m too lazy to do my washing anywhere other than in the comfort of my own home, even though I crave the fluffiness that only a tumble dryer can provide. For some reason it caught my eye one day a few months ago and got me thinking about how communities function. Everything is becoming much more insular, something that I don’t feel too comfortable with, I decided not to have a smart phone as an act of rebellion! I love meeting people and having conversations. It got me thinking that Dennistoun must be full of rich stories that I have never heard, but that inevitably make up the fabric of where I live. These ideas are always formed in the shower. 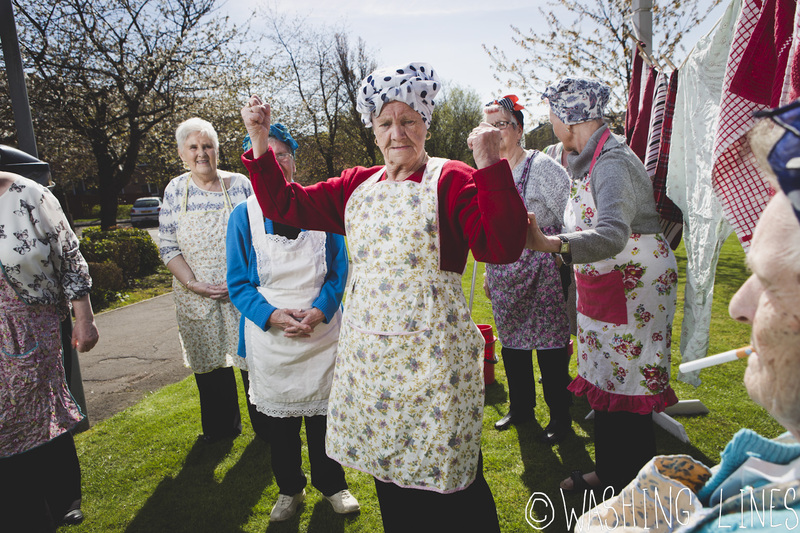 So, one morning during a very long, prune finger inducing one I came up with the project, to use washing lines as a way to engage with the community and hear as many stories as I could. But, I needed a photographer, and Eoin loved the idea. Through his artistic vision and passion for colour, I knew he could bring the project to life in a way that I couldn’t even yet imagine. After hearing about the Glasgow Open House Art Festival at a GSA Pecha Kucha event, there was a purpose for the project, to exhibit as part of their programme and bring the festival to Dennistoun for the first time. It has now been accepted into a group exhibition in Wasps through Representing Dennistoun and Impact Arts. So here we are! 2 weeks to go and many more people to meet. A few very exciting shoots this week, anecdotes of which we’ll be sharing with you. 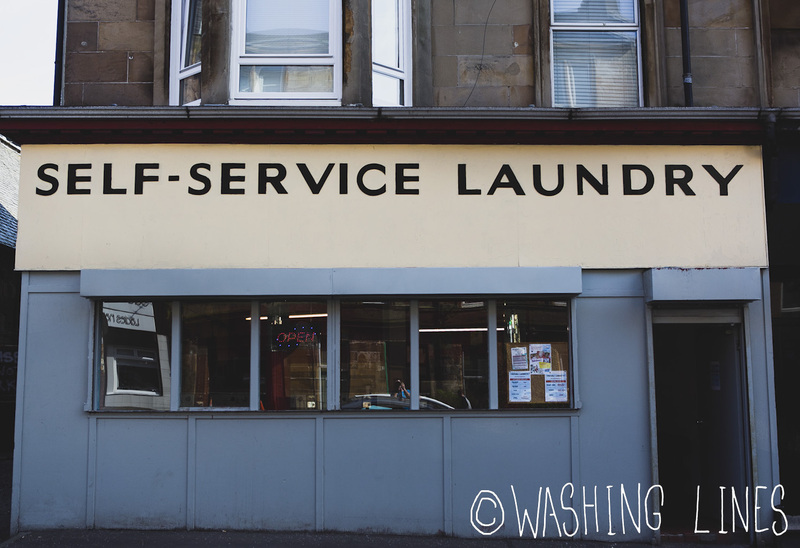 You can also keep up to date with us on Twitter @PaulaCreateStir // @eoin_carey and use the hashtag #washinglinesdennistoun to share your anecdotes with us. Funny photos of your washing would go down a treat! The launch will take place on May 2nd// Whitehill Laundrette// All welcome. Colour is one of the main building blocks on which my relationship to photography is based. It amazes me all the time because it can be found everywhere. It is inherent. Symbolic in its own way on many levels but fundamentally for me, colour always signposts me to people. Wherever the human species passes, we leave a trail of colour in our wake. Not always in a good way, but more often than not, in a surprising way. In the last few weeks walking the drives and closes of Dennistoun, I have seen colour in more unexpected ways. In the forefront of my mind over the last while are questions of Dennistoun’s identity. On the surface I have been fascinated by the image of a changed landscape. There is visible disfunction in the area’s graffiti, litter and disused spaces. On a rainy day, Dennistoun can look grey. But look a little closer and there are signs that life is stable and vibrant. The little surprises of colour are all around and give a more profound flavour of the area than a birds eye view. But like all good things, you have to slow down to notice them. Stories and storytelling are at the heart of our project. Across this body of work there is a story more universal about community and our society as a whole. We are interested in how basic habits cease, maintain or morph as an area changes. 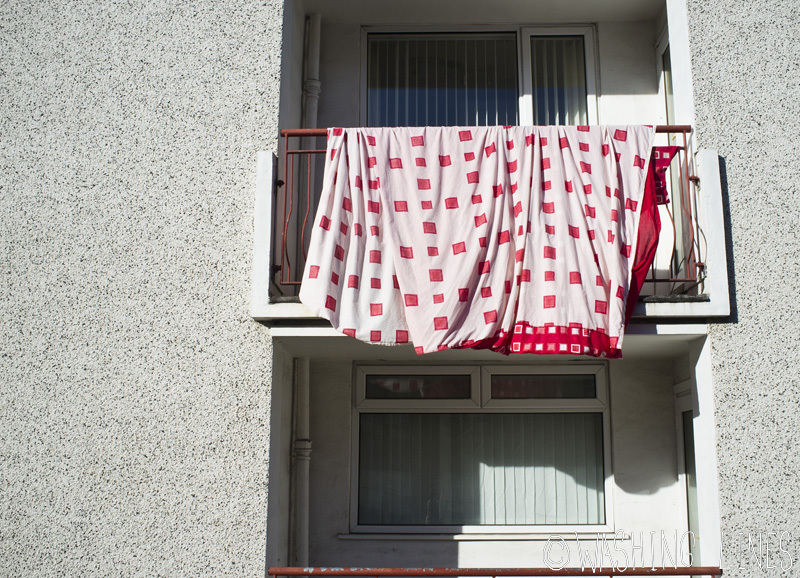 Rather than looking always at the bigger picture of Dennistoun’s changing landscape, we have found great significance in smaller, domestic rituals like washing and conversation. These can only be found in individuals though, and so we are spending a lot of time in Dennistoun meeting and talking with people. 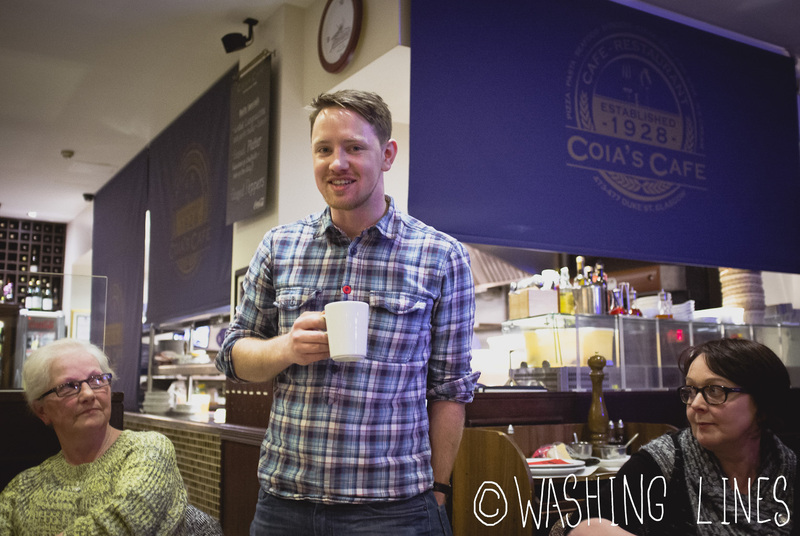 Last week we attended a terrific Storytelling (&pizza) night at the locally legendary Coia’s Cafe. The night was organised as part of Representing Dennistoun and led by seasoned storyteller Wendy Wolfson. The night was a chance to hear stories told, but more importantly, to contribute your own. As Wendy was the only accomplished and official storyteller, the content of the night was up to the audience so, confident or not, everyone stood up and shared their stories of Dennistoun. It was inspiring to see people speak, some for the first time, but what made a real impact was to hear how many people had strong and significant stories about one area. The start of a new project is the start of a new notebook for me. A place to store and sketch my growing thoughts and ideas, it becomes an inseparable ally as projects grow. These words were the first I entered, late last year, as this project began to grow from an idea to a concrete reality. Here are my very first thoughts. “It is these first words that map the emotional kernel at the heart, and spark with true intent. It is these words that lay a soft thread, from the beginning, for when the tumultuous activity conceals the origins and redefinitions settle in like a thunder cloud. 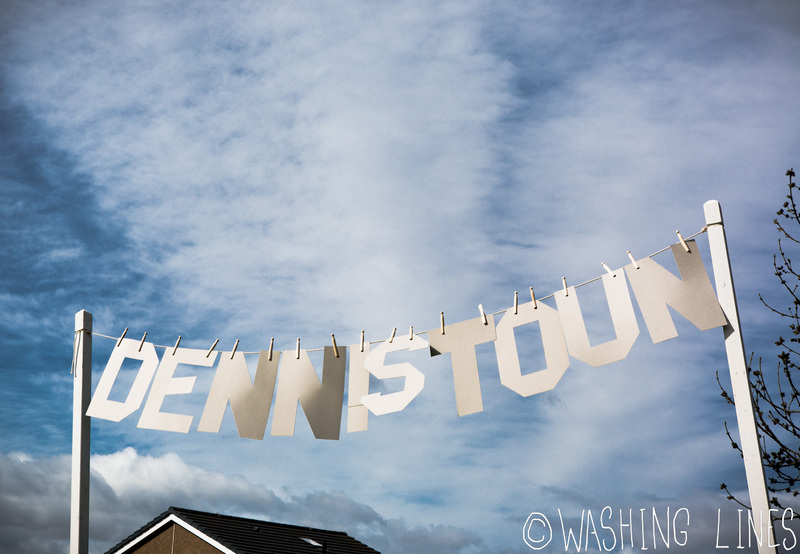 And rain is on the horizon, as with any time we think about hanging out the washing. And what of the empty lines in the back courts? What of their jaded yarns and old chipped posts and poles. What of the crisp sheets and mottled cottons that dance and hang in the open air. Each of their own quiet story on a domestic stage. Cuffs and stitches, logos and patterns, faded in and worn out. A portrait of imperfection. A landscape of reality.